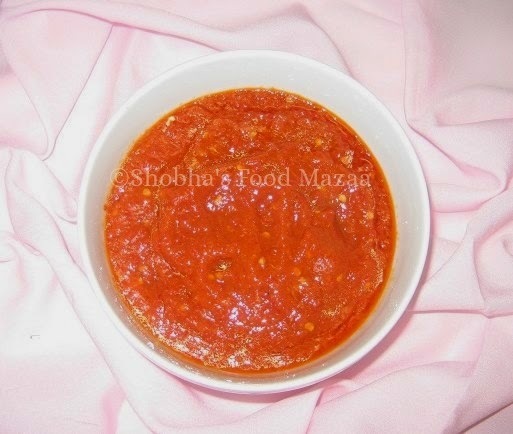 Tomato puree ................ 2 tbsp. Wash and cut the red chillies. Grind all the ingredients to a smooth paste. Heat about 2-3 tbsp. of oil and fry the chutney. Simmer for 3-4 mins. It stays good for 8-10 days in the refrigerator.You can also freeze it. looks delicious and yummy !!! This is the kind of chutney that I would want to put on everything. This versatile chilli and garlic chutney is a must in my house too. Goes well with anything! True dear.. love it too.